White-nose syndrome has killed 98 percent of the little brown bat population. Little brown bat populations are unlikely to recover from a widespread fungal disease anytime soon, according to a recent study. And if other bat populations follow suit, say goodbye to your margaritas! Bats are one of the largest global pollinators of agave — the plant tequila is made from — and are diminishing quickly in the U.S. from the condition. “White-nose syndrome is the biggest wildlife catastrophe in America in the last 100 years,” said Rob Mies, executive director of the Organization for Bat Conservation — a national advocacy group focused on the preservation of bats and based in the Cranbrook Institute of Science in Bloomfield Hills, Michigan. 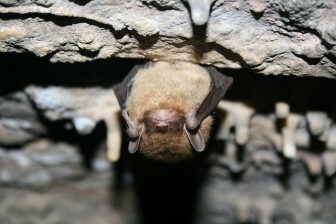 Although the report only focused on little brown bats, the model created by the study could be applied to all bat species affected by white-nose syndrome, said Wayne Thogmartin, an ecologist for the U.S. Geological Survey and one of the lead researchers on the study. Each scenario had the same result: it will take decades to recover from a disease that has wiped out 98 percent of little brown bats. “All the scenarios were washed away by the magnitude of the disease,” Thogmartin said. Optimistically, little brown bats will start increasing reproduction sometime in the 2020s — but only if the disease is under control. Not all species of bats are affected by white-nose syndrome. But the condition is in five Canadian provinces and 30 U.S. states. It kills a million bats a year, Mies said. Why do we need bats? Bats are more than Count Dracula’s alter ego — they have a crucial role in the ecosystems in the Great Lakes and globally. They are the primary predators of night-time insects, feasting on corn earworm moths and emerald ash borer beetles — two insects that could wreak havoc on Great Lakes region crops if uncontrolled. A 2011 study estimated that U.S. farmers save anywhere from $3 billion to a little more than $50 billion on insect control costs because of bats. In addition to agave, bats pollinate over 300 species of fruit, including bananas, mangoes and guava. Bats also keep forest ecosystems healthy — something vital to states dependent on outdoor tourism like Michigan and Wisconsin. Studies about the diminishing bat population have pressured state officials to promote bat conservation. “It’s a realization that we need to do all that we can,” said John White, a biologist in charge of the bat conservation program at the Department of Natural Resources (DNR) in Wisconsin — where white-nose syndrome was identified last year. The Wisconsin DNR is taking an educational approach to hopefully prevent the fungus from traveling from site to site, he said. They are educating cave visitors about properly cleaning their footwear before they travel to another cave. Ecologists suspect that’s how the fungus was first introduced to caves in the U.S., Mies said. Researchers are testing treatments in the field, he said. He declined to disclose the locations because it would compromise the research, but some are in Great Lakes states. White-nose syndrome is caused by a fungus from central Europe. It first appeared in the U.S. in Howes Caverns — a popular tourist cave in upstate New York. A tourist visiting the cave most likely unknowingly introduced the fungus to the cave through contact, Mies said. The fungus grows in cold caves and mines and the only thing it negatively affects are 25 out of 45 bat species, he said. Once physical contact with the fungus is made and the bat is infected, it alters the animal’s metabolism, causing it to wake up mid-hibernation. It ends up starving and dehydrating before winter is over, Mies said. Bats only have one baby a year and the chances of that pup living through the winter regardless of white-nose syndrome is only 10 percent, White said. That means deaths due to the fungus have significant impacts on the populations. Although officials are trying to manage white-nose syndrome at the state level, there are things ordinary citizens can do to help, Mies said. – Replace dead trees with bat houses so bats have a safe place to raise babies. – Replace lawns with wildflower gardens so bats have food. “They need safe places to live and safe places to eat — so that way they can continue the ecological benefits they provide us,” Mies said. Why is a bat house safer for bats than a dead tree? Generally dead trees are a good thing for many kinds of wildlife.